The Daily GRRR! HEADLINES for Jan. 26, 2015. 1. Enbridge emergency kits rejected as “due diligence” in Aamjiwnaang FN. 2. Dene trappers hold highway checkpoint to protest resource extraction. 3. Mount Polley mine seeks gov approval to restart after 2014 eco-disaster. 4. Indigenous warriors will be tried for sabotage after shutting down oil field. 5. Montana’s worst crude oil spill wreaks havoc on the Yellowstone River. 6. Seneca Lake Uprising marks 200th arrest in 3 months of water defense. 7. WPIRG hosts 2015 School of Public Interest on “Strategies for Solidarity”. Welcome back to SoundFM! You are now listening to The Daily GRRR! on the air every weekday morning from 9-10 a.m. here at 100.3fm, CKMS in Waterloo, Ontario, and SoundFM.ca on the web. This is Kathryn and I’ll be your host on this Monday morning show for January 26th, 2015. At 3:30 pm on January 15th 2015, representatives of Enbridge Pipelines Co. failed to appear at the company's own public information session in Aamjiwnaang, and around 50 guests were stood up at the open house. The event was billed as an opportunity for community members to provide feedback and ask questions about Enbridge's ongoing operations in Aamjiwnaang territory, and Enbridge had planned to conduct a presentation about their so-called corporate "Integrity Program" while distributing emergency supplies to the community. But in the wake of Enbridge's cancellation, Aamjiwnaang community members have been left with unanswered questions and zero information ~ and tote bags with meagre “emergency supplies” don’t begin to cover the risks that Aamjiwnaang residents face from Enbridge’s dangerous energy projects. Upon arrival at the open house, residents of Aamjiwnaang were provided with one red tote bag, or "Starter Emergency Kit", per household. Each bag contained: matches, a flashlight, a radio, work gloves, hand warmers, water purification tablets, hand sanitizer, and a plastic container. But while useful in the event of being lost in the woods, these so-called “Starter Emergency Kits” will not help community members mitigate the damage of Enbridge Pipelines’ leaks or spills. 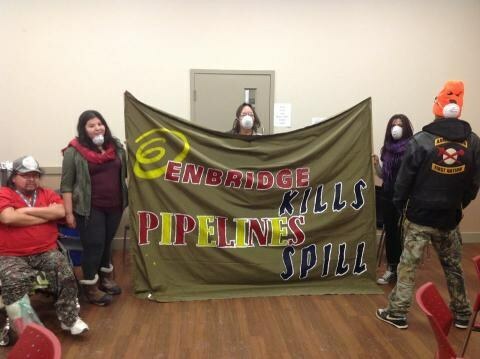 It is unclear what prompted Enbridge to schedule the open house or to distribute the kits. It is also unclear why Enbridge did not attend the event, considering company representatives were in Aamjiwnaang's Band Office down the road when news that they would not be attending after all was brought to Aamjiwnaang residents a mere 30 minutes before the event’s dinner would be served. Nonetheless, community members used the opportunity to share information among themselves about environmental awareness and corporate responsibility. Most notably, a letter to Enbridge was circulated by the group Aamjiwnaang & Sarnia Against Pipelines (ASAP) for public review and discussion. The letter states "The root causes of contamination in our territory are not being addressed and as such do not represent any due diligence on your company’s behalf." The letter also "reject the suggestion that our community members should be responsible for helping mitigate any damage cause by Enbridge Pipelines." As reported by the Council of Canadians, a group of Dene trappers is maintaining a presence on the side of Highway 955 near La Loche, Saskatchewan, to highlight the impact of oil and mineral exploration on the land their people have lived off of for centuries. La Loche is located in Treaty 8 territory about 600 kilometres north of Saskatoon and about 100 kilometres east of Fort McMurray, and on November 22, the Northern Trappers Alliance set up a peaceful blockade on the highway to stop vehicles from companies that are drilling for minerals, oil, or uranium and disrupting their trapping area. Their stated intention was to hold the blockade until Christmas or beyond, but by December 1, the RCMP had served an injunction against the blockade on behalf of the Saskatchewan Ministry of Highways and Infrastructure. Despite the police towing away their camper-trailer, the group has maintained a checkpoint on the highway since then. Among the issues the Dene have been drawing attention to is: the permit granted the Calgary-based energy company Cenovus for a 30,000 barrel per day tar sands operation which would include nearby Axe Lake; the impacts of the Cluff Lake uranium mine about 60 kilometres outside of La Loche; and Kelowna-based Fission Uranium surveying to set up a mine in the Athabasca Basin. Speaking out about how companies have disrespected the Dene people, trespassed on their territory, ripped apart their land, and left oil barrels and other industrial waste in nature, they proclaim, "The Northern Trappers Alliance wants to be consulted by industry and the community leaders. They want the industrial waste that has been left behind cleaned up and that the Dene people decide how to use their land." The Northern Trappers Alliance is still in need of our support and is seeking donations and supplies, so we’ve linked to their Facebook page here on the podcast page for today’s show. The irresponsible corporation Imperial Metals, whose Mount Polley mine in central British Columbia breached a tailings pond last summer, has submitted a plan to restart the copper and gold mine. One morning in early August, a section of the tailings pond dam up at the Mount Polley mine crumbled, releasing 10 million cubic metres of toxic mine water and almost five million cubic metres of finely crushed rock, known as tailings. The water and tailings formed a thick slurry that roared down Hazeltine Creek, knocking down trees and anything else in its way. It poured into Quesnel Lake, one of the largest — and the deepest — fresh water lakes in B.C. The mine has been closed since the that cataclysmic event, the worst of its kind in Canadian mining history. Worse still, in the wake of this environmental disaster, The Globe and Mail reports that the B.C. government appears to have systemically breached its freedom of information law by withholding information related to the collapse of the tailings dam at the Mount Polley mine, from withholding recent inspection reports related to the tailings pond to their outright refusal to hand over a 22-year-old report on the Mount Polley mine. In the words of Calvin Sandborn, the legal director for the University of Victoria’s Environmental Law Centre, “The provincial government’s refusal to provide timely access is not only highly troubling, but verges on the absurd… the greatest mining environmental disaster in B.C. history is a matter of clear and pressing public interest.” Other Canadian jurisdictions routinely release data such as safety inspection reports and government orders related to tailings ponds. However, the B.C. government has blocked the release of documents, saying public disclosure may undermine its ability to prosecute under the Mines Act or other legislation. This rationale from the provincial government will be entirely undermined if they approve Imperial Metals’ request to reopen the Mount Polley mine, so we have to hope that their alleged intention to prosecute Imperial Metals’ for the tailings pond catastrophe isn’t just lip service to pacify their concerned constituents. As reported by Indian Country Today Media Network, after attacking and shutting down an oil field in Ecuador in early January, most of the Waorani warriors who were arrested for the attack will be tried soon for sabotage and paralysis of public services according to various reports. On January 7, seven Waorani warriors invaded the Petrobell oil field in the Amazonian province of Pastaza, causing enough damage to shut down 11 oil wells operating at the facility. Ecuadorian military were called to the scene and six soldiers were wounded in the clash with the warriors who were armed with blowguns, shotguns, pistols and spears. The next day, a judge ordered that six of the seven Waorani men be imprisoned, while a seventh man was allowed to remain free with certain restrictions based on his advanced age. Leaders from the Waorani Nationality of Ecuador held negotiations with Ecuadorian officials on January 9 in Puyo, the capital of Pastaza province and located near the site of the attack. The position of NAWE at the meeting with officials was that they would offer the government a guarantee that the Waorani would no longer attack or provoke incidents at oil facilities if the warriors were released and not charged, said NAWE President Moi Enomenga, who has been known internationally since winning the 2011 National Geographic Buffett Award for Leadership in Conservation. Enomenga asserted that government officials agreed with the terms of the NAWA proposal but that further talks had to occur with other provincial officials, and unfortunately it now looks as though the deal may not go through, forcing the warriors to face trial on the aforementioned charges. As reported by Al Jazeera and PBS.org, a ruptured oil pipeline leaked forty to fifty thousand gallons of crude oil into the Yellowstone River in Montana last Saturday, contaminating the drinking water for the nearby town of Glendive, where residents ordinarily draw their drinking water from the river. This disastrous spill is only the most recent for this river and adds to a history of pipeline malfunctions—in 2011, the Exxon Silvertip Pipeline spilled 63,000 gallons of oil into the Yellowstone River two and a half hours outside of Yellowstone National Park. This newest disaster also comes less than two weeks after the Senate voted 63–32 to advance the bill that would approve the Keystone XL pipeline, which would cross over 1,700 bodies of water in addition to the now oil-slicked Yellowstone River. The town of Glendive began detecting the contaminant benzene in its drinking water last Monday, just two days after the spill. According to reports by Inside Climate News, this particular pipeline has its own history of trouble, including a legacy of weak welds made in the 1950s. The segment under the river had been replaced in the 1960s or 1970s, but Bridger Pipeline ~ the company that owns the pipeline ~ remains ignorant to how or with what type of pipe it was replaced. As alluded to already, this disaster is far more than just a local issue, too. As more than 100 emergency workers hacked at thick river ice in a frantic attempt to find and contain the spilled oil, the U.S. Senate in Washington worked deviously to force through an approval of the Keystone XL pipeline. But that might not be so straightforward, as the Yellowstone River spill bears many dark similarities to the January 2014 chemical spill in West Virginia’s Elk River and the now-notorious 2012 tar sands pipeline spill in Michigan’s Kalamazoo River. This latest spill in Montana has now wrenched focus back to Keystone’s risks, but the calamity in Glendive has lent only grim resignation and no comfort to its concerned opponents. While President Barrack Obama has vowed to veto the Keystone XL pipeline, the enthusiasm of its boosters has left many who live in its path worried that it will still be built, possibly at the expense of vital infrastructure necessary to maintain basic upkeep and without sound contingency plans for its inevitable spills. As reported by EcoWatch.com, We Are Seneca Lake is an ongoing, citizen-based civil disobedience campaign that has been going strong since October and seeks to protect New York state’s Seneca Lake and the surrounding region from gas storage expansion by Texas-based energy company Crestwood Midstream. Over 200 arrests have been made in the grassroots fight to defeat Crestwood’s plans to repurpose the crumbling salt mines underneath Seneca Lake’s hillside into massive gas tanks for the highly-pressurized products of fracking, which include the toxic and volatile gases methane, propane and butane. Seneca Lake, a source of drinking water for 100,000 people, is a very deep lake that drains very slowly. A contamination event, hydrologists explain, would linger not days or weeks but over a time scale measured by human generations. Because of its depth, Seneca Lake also creates a unique, self-moderating microclimate for the entire Finger Lakes region, allowing vineyards to flourish on the hillsides and making possible their thriving wine industry, which is the bedrock of the local economy. The methane gas storage expansion project is advancing in the face of broad public opposition and unresolved scientific questions about geological instabilities, fault lines and possible salinization of the lake. Crestwood has indicated that it intends to make Seneca Lake the gas storage and transportation hub for the entire Northeast, as part of the gas industry’s planned expansion of infrastructure across the region. The wise decision by New York Governor Andrew Cuomo to ban fracking in the Empire state—and his corollary announcement of a $20 million green jobs competition—only makes the plan to store mass amounts of fracked gas under Seneca Lake seem even more absurd. The two-day event is entirely free and will take place on February 5th and 6th. The location has yet to be announced, but updates will be posted to WPIRG website and on the Facebook event page, both of which we’ve linked to on the podcast page for today’s show. We’ll also update you on here on the Daily GRRR! as the event approaches, but for now, we’re pleased to report that the tentative schedule includes: a #BlackLivesMatter teach-in on “Resisting White Supremacy and Other Forms of Oppression on Campus and the Community”; the book launch for “A Line in the Tar Sands”; a workshop on “Resisting UW’s Complicity in Ecological Destruction, Colonialism and Global Inequality”; as well as a conference social on the first night and a closing roundtable discussion on the final afternoon that will discuss “Solidarity and Allyship: Complementary or Contradictory Approaches for Organizing”.